Objectives: We sought to evaluate the outcomes of a single kidney transplant from pediatric donors into adult recipients after controlled circulatory death. Materials and Methods: A retrospective, single-center review of all adult recipients who received a single pediatric kidney from controlled-cardiac deceased-donors (aged, < 9 years old) between January 2006 and March 2008 was performed. Results: Eleven adult recipients (aged, 16-41 years) used single renal grafts from the controlled-cardiac deceased-donors (median donor age, 74 months; range, 49-106 months; median donor weight, 20.95 kg; range, 16.6-37.8 kg). The median recipient age was 27 years (range, 16-41 years; median recipient weight, 47 kg; range 39.5-53.6 kg). The patient’s serum creatinine level gradually decreased, and the estimated glomerular filtration rate increased stably more than 2 times during follow-up. The graft length increased significantly the first week after transplant compared with that recorded immediately after reperfusion (P < .001) and grew slightly thereafter. Acute rejection occurred in 1 patient. Nine patients had high renal artery blood flow velocity index at 1 to 2 cm. Beside the anastomosis (167-321 cm/s), only 1 patient developed hypertension and slightly increased serum creatinine at 14 weeks after transplant. The 1-year patient/graft survival was 100%. Conclusions: Use of single kidneys from pediatric donors after controlled cardiac death could expand the donor pool without compromising recipient outcomes. A critical organ shortage and prolonged wait time for a kidney transplant has led the transplant community to consider strategies to expand the donor pool, including organ donation after cardiac death, donation from pediatric donors, and solitary transplant of kidneys used to transplant en bloc. Transplant of small, pediatric, deceased-donor kidneys to adults has been reported to be associated with increased vascular and urinary complications,1, 2 and to increase the incidence of acute cellular rejection and delayed graft function.3 Additionally, concerns about transplanting an insufficient nephron mass to adult recipients also have emerged. The en bloc technique should, theoretically, overcome these complications by providing sufficient nephron mass. However, it reduces by one-half, the number of potential transplant recipients. And the en bloc technique, itself, may be associated with a much higher risk for developing vascular complications, especially vascular thrombosis, in the graft. There are no studies that evaluate the outcomes of kidney transplant from a pediatric donor after controlled cardiac death, not to mention that of a single transplanted one. Moreover, whether a small recipient body weight accounts for good long-term outcomes remains uncertain. This study describes the results obtained with transplant of single kidneys from controlled-cardiac, deceased-donors (aged, < 9 years) into selected adult recipients with low-body weight. This was a retrospective review of all the adult recipients who received a single pediatric kidney from controlled-cardiac deceased-donors (aged, < 9 years) between January 2006 and March 2008 in a single center. All donors were diagnosed with brain death, and their parents signed the application for donation after being given informed consent. The study protocol was approved by our local institutional ethics committee, and conforms to the ethical guidelines of the 1975 Helsinki Declaration. Donor care was provided under the direction of the intensive care team. Life-support measures were withdrawn under controlled circumstances in the operating suite by the intensivist and the primary nurse, after which the patients were observed for 5 to 15 minutes. Cardiac death was declared 2 minutes after cardiocirculatory function ceased,4 and then the organ-donation process was begun. Donors with primary renal disease, diabetes mellitus, systemic sepsis, or malignancy were excluded. Kidneys were received as a pair on intact aortic and vena caval segments (Figure 1). Back table inspection and splitting were performed under aseptic conditions in the operating suite. Paired kidneys were separated as long as both kidneys appeared normal; were without surgical damage; had a single vein; and either a single artery or both renal artery ostia were no more than 3 mm apart. In our patients, all kidneys had a single artery. The donor’s renal artery and the recipient’s right internal iliac artery were anastomosed end-to-end, and the donor’s renal vein and the right external iliac vein were anastomosed end-to-side. All anastomoses were performed with 6-0 absorbable sutures (Tyco Healthcare, UK). The graft ureter was anastomosed to the urinary bladder of the recipient by the submucosal tunnel technique without a double-J stent. Immunosuppression consisting of induction therapy with either anti-T lymphocyte porcine immunoglobulin (Wuhan Biological Pharmaceutical Institute, Wuhan, China) (final dosage, 10 mg/kg/d) or Orthoclone OKT3 (Ortho-McNeil Janssen Scientific Affairs, LLC, Customer Communications Center, Titusville, NJ, USA) (5 mg/d) was initiated in the operating suite before revascularization of the graft, continued for 7 days, and followed by cyclosporine or tacrolimus-based triple therapy. Methylprednisolone (dosage, 9 mg/kg) was administered on the day of transplant, and then reduced to 7 mg/kg and 6 mg/kg on the next 2 days. Oral prednisone (dosage, 60 mg/d) was administered on day 3 after surgery, and tapered to a maintenance dosage of 10 mg/day. Treatment with oral tacrolimus or cyclosporine was initiated at a dosage of 0.10 mg/kg/d or 4-5 mg/kg/d when the serum creatinine level exceeded 300 µmol/L. Dosage was adjusted to a trough level of 250-350 ng/mL for cyclosporine or 8-10 ng/mL for tacrolimus for the first 1-3 months, and thereafter, the target was reduced to a trough level of 150-250 ng/mL for cyclosporine or 6-8 ng/mL for tacrolimus. Mycophenolate mofetil was initiated from day 3 at a dosage of 0.5-1 g/d. The clinical endpoint included the incidence of primary nonfunction, delayed graft function, acute rejection, and the graft function as well as patient/graft survival rates. Estimated glomerular filtration rate was measured using the abbreviated modification of diet in renal disease formula: estimated glomerular filtration rate = 32 788 × [serum creatinine (µmol/L)]-1.154 × [age]-0.203 × [0.742, if patient is female]. The length of the graft kidney was measured manually immediately after reperfusion and again using color Doppler ultrasonography 1-4 weeks after surgery, and then again at 2, 3, 6, and 12 months after the transplant, and then at the latest follow-up (March 2009). Mean values were compared by independent tests (P < .05). From January 2006 to March 2008, 11 adult patients received single renal grafts, all of which were primary grafts, from 6 controlled-cardiac, deceased-donors (aged, < 9 years). The median donor age was 74 months (mean, 75.3 ± 22.8 months; range, 49-106 months), and the median donor weight was 20.95 kg (mean, 23.9 ± 8.4 kg; range, 16.6-37.8 kg). The median recipient age was 27 years (mean, 28.2 ± 7.9 years; range, 16-41 years), and the median recipient weight was 47 kg (mean, 46.9 ± 4.2 kg; range, 39.5-53.6 kg). The donor terminal creatinine level was 104 ± 24.3 µmol/L. Seven female and 4 male recipients had a median body mass index of 18.35 (range, 16.2-21.6). Nine of the 11 recipients had been on hemodialysis, and the other 2 patients were on peritoneal dialysis for a median of 19 months (range, 7-33 months). The cause of end-stage renal disease in the 11 recipients was glomerulonephritis (in 5 patients), IgA nephritis (in 1 patient), diabetes (in 1 patient), polycystic kidney disease (in 1 patient), and unknown (in 3 patients). The warm ischemia time, cold ischemia time, and implantation time averaged 22.7 ± 6.6 minutes, 19.7 ± 3.8 hours, and 40.9 ± 9.4 minutes. Three recipients (27.3%) had delayed graft function, and 1 exhibited a modest a daily decline in serum creatinine in the first 2 weeks after the operation, all of which returned to normal before discharge (about 1 month after transplant). Serum creatinine level gradually decreased from 1 week to 1 year, and remained under normal levels to the latest reported follow-up. The estimated glomerular filtration rate increased stably by more than 2 times (35.9 ± 19.8 vs 77.3 ± 24.99 mL/min) at the latest follow-up compared with that at 1 week after the transplant (Figure 2A). 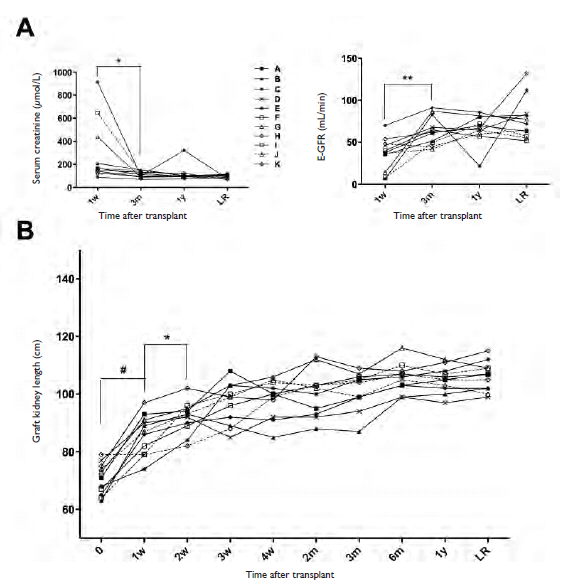 The graft length increased dramatically the first week after the transplant compared with that recorded immediately after reperfusion (P < .001) and grew easily thereafter, reaching a mean of 105.1 ± 4.5 mm at 12 months after the transplant (Figure 2B). No stenosis or leakage after ureteroneocystostomy was observed. Median follow-up was 17 months (mean, 21.8 ± 9.5 months; range, 12 – 38 months). Acute rejection occurred in 1 patient, which was reversed successfully by a high intravenous dose of methylprednisolone. Color Doppler ultrasonography showed that the high renal artery blood flow velocity index of 1-2 cm, besides the anastomosis, was 167-321 cm/s in 9 patients within 1 month after the operation. No significant clinical manifestations were seen in most of these patients during follow-up, except 1 patient who developed hypertension and slightly increased serum creatinine 14 weeks after the transplant. These were cured by percutaneous balloon catheter dilation (Figure 3). The 1-year patient/graft survival was 100%. Transplant surgeons are hesitant to use grafts from pediatric-controlled cardiac-deceased donors owing to their small size and prolonged ischemia time, with inefficient graft function and surgical complications presenting significant concerns. Several centers have reported excellent outcomes using single small-sized kidneys from pediatric donors to adult recipients. However, transplanting a single kidney from a pediatric-controlled cardiac-deceased donor into an adult recipient is challenging. We report our observation that kidneys from controlled-cardiac deceased-donors (aged, < 9 years) could be useful for solitary transplant into select adult recipients of small body weight, with encouraging outcomes after 1 year. El-Sabrout and associates5 reported that the low donor/recipient body weight ratio might contribute to inferior long-term renal allograft survival, possibly owing to hyperfiltration. Most recipients of pediatric grafts in our series were relatively young female patients with a low body mass index. The systolic blood pressure of the recipients was maintained between 110 and 130 mm Hg after transplant for the same purpose of avoiding hyperfiltration. Chen and associates6 reported that the incidence of surgical morbidity in recipients of pediatric grafts was much higher than that in controls, including renal graft artery stenosis (33% vs 11%). We found 9 recipients in our series had elevated renal artery blood flow velocity index near the anastomotic site detected by color Doppler ultrasonography. Among them, only 1 patient developed renal artery anastomotic stricture, presenting as increased blood pressure and serum creatinine. As reported by others,7 percutaneous balloon catheter dilation is also the first-line treatment for arterial anastomotic stricture at our center, and stent implantation is only recommended for those who fail or recur after the first balloon dilation therapy. In this study, blood pressure and serum recovered to normal, soon after percutaneous balloon catheter dilation. No such problems occurred in the other recipients. The present work confirms excellent outcomes with the transplant of single kidneys from pediatric organ-donation-after-controlled-cardiac-death donors. More-intensive use of this strategy could hopefully expand the donor pool without compromising recipient outcomes. Satterthwaite R, Aswad S, Sunga V, et al. Outcome of en bloc and single kidney transplantation from very young cadaveric donors. Transplantation. 1997;63(10):1405-1410. Hayes JM, Novick AC, Streem SB, et al. 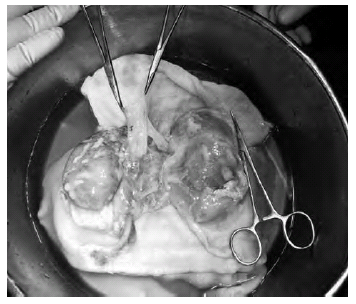 The use of single pediatric cadaver kidneys for transplantation. Transplantation. 1988;45(1):106-110. Modlin C, Novick AC, Goormastic M, Hodge E, Mastrioanni B, Myles J. Long-term results with single pediatric donor kidney transplants in adult recipients. J Urol. 1996;156(3):890-895. Steinbrook R. Organ donation after cardiac death. N Engl J Med. 2007;357(3):209-213. El-Sabrout R, Buch K. Outcome of renal transplants from pediatric donors <5 yr of age. Clin Transplant. 2005;19(3):316-320. Chen CH, Shu KH, Yang CR, Cheng CH, Wu MJ, Lian JD. Long-term results with pediatric kidney transplants in adult recipients. J Formos Med Assoc. 1999;98(12):807-813. Irtan S, Maisin A, Baudouin V, et al. Renal transplantation in children: critical analysis of age related surgical complications. Pediatr Transplant. 2010;14(4):512-519. Sureshkumar KK, Reddy CS, Nghiem DD, Sandroni SE, Carpenter BJ. Superiority of pediatric en bloc renal allografts over living donor kidneys: a long-term functional study. Transplantation. 2006;82(3):348-353. From the 1Department of Organ Transplantation, Changzheng Hospital, Shanghai; the 2Organ Donation Working Group, the Red Cross Organization, Shenzhen; and the 3Institute of Organ Transplantation, Tongji Hospital, Wuhan, China. or: Zhonghua Chen, Institute of Organ Transplantation, Tongji Hospital, Wuhan, China 430030. Figure 1. Kidneys received as a pair on intact aortic and vena caval segments. Abbreviations: LR, latest report; m,month; w, week; y, year. Figure 3. Angiographic images of the renal arterial anastomotic stricture (indicated by arrowhead) before (A) and immediately after (B) percutaneous balloon catheter dilation.